Here is my latest fabric painting…in the works! 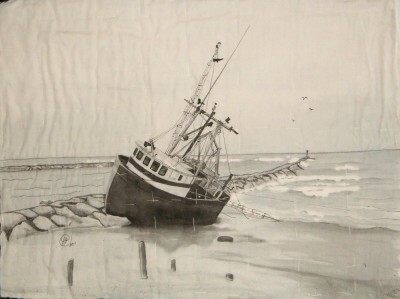 The picture was painted on white cotton with black fabric paint (Dye-Na-Flow) that was thickened with Sodium Alginate. The bright white areas, like the seafoam on the waves and the wheelhouse, were masked with a commercial brush-on masking gel prior to painting. This step helps to preserve the brights no matter what I do. After the painting was finished and the alginate and mask were washed out, I started to hand quilt which is why there are basting stitches running through the piece. The hand quilting thread and stitches were too large in proportion to the lines in the design. I pulled it out and began to machine quilt – not my favorite – so here it sits waiting for me to get inspired again to get quilting. Even though it isn’t finished, I thought that you might like to see another example of painting on fabric with thickened fabric paints or dyes. I think you did a fantastic job on this using the dynaflo paints. Although I do a lot of drawing, I have never attempted this on fabric. But…I think I should. That is stunning! Amazing details! I am glad you enjoyed my painting, thanks. The thickened paint really helps to achieve detail but a really good permanent pen is essential to drawing fine lines like the rigging. It would be impossible to get such fine lines on fabric with a brush – I tried : ) Give it a go! I think you do beautiful work. Want to see it quilted too! Great job. Thank you. I love to paint on lots of surfaces but I must say that fabric is the most challenging because the paint and dye love to bleed out where you don’t want them to. It is always and adventure! Really wonderful, thank you for sharing. You are welcome, however I whish to thank you for the kind words. Sometimes I get distracted and need a nudge to get going again. Having the Quilt List people to share with means a lot, as I’m sure you know. Very impressive painting! Be sure to show us the finished results. Thank you. And thanks to everyone who has left comments, the chances of my finishing the quilting have gone up. Boy do I drag my feet when it comes to sitting down at the machine to quilt. I can paint all day but……. need a magic quilting fairy! !